Need a touch of color but can't get to the beach? Smooth on Balm Shelter Tinted Moisturizer with SPF 18 ($25). It improves tone and texture so your skin looks smooth. 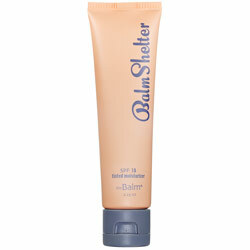 Plus, it's tinted for an added dose of color and has spf 18 to protect you from the sun's harmful rays. I wore it yesterday and it really helped minimize fine lines--you know, the ones you really want to hide! As far as the tint goes, the challenge is in finding a shade to match your skin tone. It comes in light, lightweight and medium. I tried light/medium which seemed at little too light at first but blended in perfectly. A definite must-have for your summer makeup bag. See more at www.thebalm.com. Thymes wants to hear from you! For a limited time only, tell Thymes what you think about their Kimono Rose Collection and receive a complimentary 2oz Kimono Rose Body Lotion! This deal is good while supplies last or until July 14th. Check the company's Facebook page for details on how to receive your free body lotion. Labels: body lotion, thymes, what do you think? I love getting spa treatments...but I also love feeling like I've just been to a spa. Aside from walking out the door feeling relaxed and rejuvenated, I love the way I smell! All those intoxicating scents mingle in the air and on my skin, keeping me calm as I head home. The Vanda Orchid Body Balm ($60) from June Jacobs Spa Collection is one of my favorite spa scents--thanks to the delicate bouquet of orchid extract it embodies in its luxurious formula. And while it smells heavenly, it also really works to moisturize my skin. Shea butter with nourishing oils of squalane, jojoba and sunflower seed soften, protect and replenish lost moisture, a blend of white, red and green tea extracts combined with goji berry, pomegranate and grapeseed extracts help to neutralize free radicals, protect the skin from environmental toxins and combat the visible signs of premature aging. Truthfully, though, I don't have to know how the formula is concocted. All I know is that it leaves my skin soft and smooth, adding hydration where I need it most. A must-have for summer, get this and other amazing June Jacobs products at www.junejacobs.com.